During the summer, we're all used to the sun setting over the Council Ring. During the winter, however, visitors to camp are very surprised when they realize that the sun actually sets over Tipi Island. With camp being so far north, you can see a notable difference of where the sun is in the horizon, rising near swim point and, throughout the day, moves across the southern horizon. 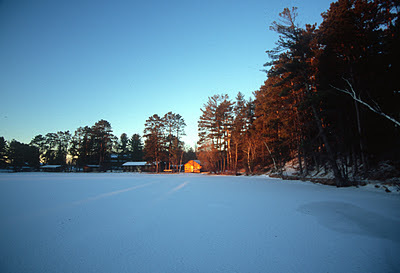 Here, you can see the setting sun reflecting off the front of cabin J6.